Lobster and Steamers in Maine–Oh, My! 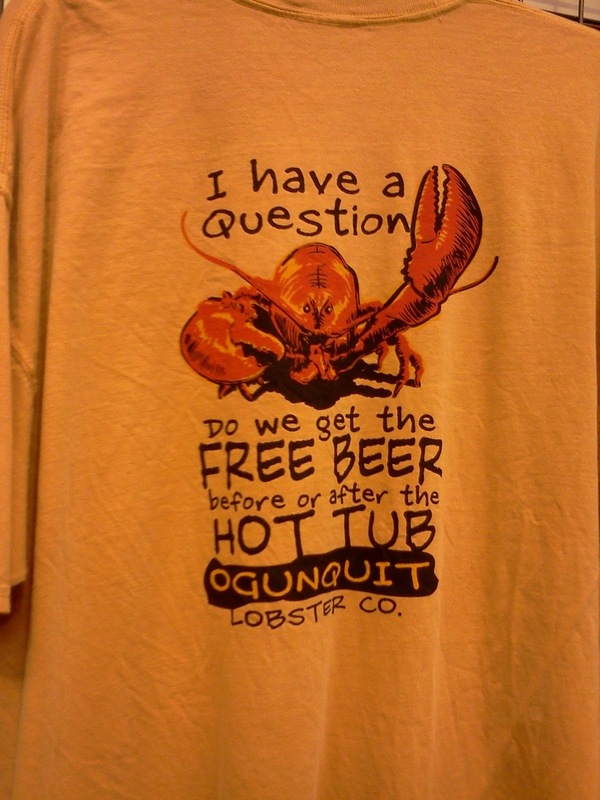 Last weekend, I drove a couple of hours north for dinner in Maine at an old family favorite–the Ogunquit Lobster Pound. After a brief stop at a New Hampshire Liquor & Wine Outlet–which, by the way, carries no beer–my companion and I arrived at the OLP a bit before 5:00 and happily discovered that the casual restaurant had opened early. The ordering process at the bare-bones OLP is a little funky. You’re seated in the rustic dining room and order drinks. Then if you want a whole lobster–and who doesn’t? ?–you go back outside and place your order at the huge tank. You can pick out your own lobster, but I don’t like sentencing a specific one to death, so I just requested a two-pound, hard-shell male. We also ordered a half-pound of steamed clams. I’d forgotten how much I love steamers–soft and sweet and succulent! Then came the lobster. Now, I can’t actually eat a two-pound lobster, but the meat is much more tender once they reach that size, so I just finish what I can and take the rest home to make lobster salad. Also, soft-shelled lobster appear to be priced cheaper, but the hard-shelled have more meat. And the males, of course, don’t have roe, which some people like but I don’t. The OLP is popular with tourists, and the lobster comes pre-cracked. You just have to open the shell, pull out some meat, swirl it in the drawn butter, and enjoy. It was just the way I’d remembered–the slight sweetness of the al dente meat set off by the butter. Fortunately or un-, I ate too much of the lobster to indulge in the OLP’s popular deep-dish blueberry pie, which I’d loved as a kid. After dinner, we went for a walk in the cool September evening, popping in and out of the tourist shops with which beach-resorty Ogunquit is peppered. We saw a few things worth a laugh if not the price.